One of the biggest myths about fiberglass pools is that they can either float or pop up if they are not properly maintained. All fiberglass pools should be installed over a sump system if there’s a large amount of water under the pool. This prevents pop ups. Your pool should always be filled with water. The weight of the water helps prevent the pool from popping up and floating. Fiberglass pools use to look cheap back in the day but over time they were designed to give people an affordable and easy way to install an inground pool. 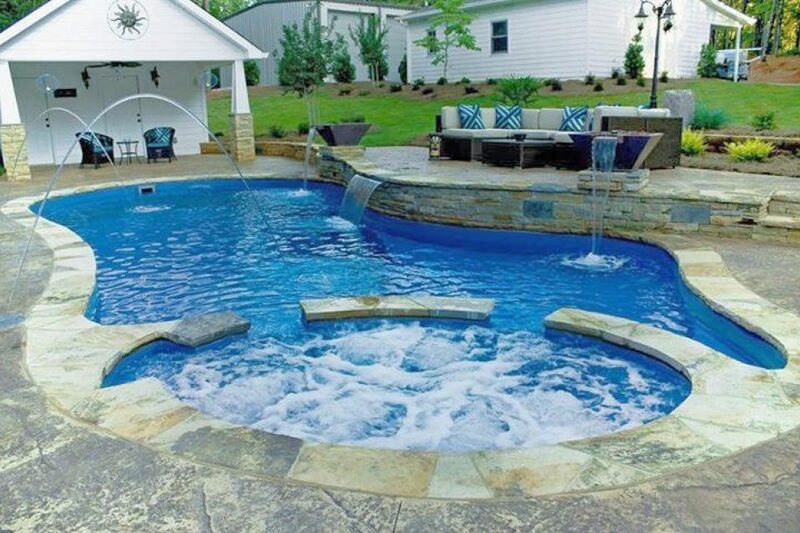 Some of the available options for a fiberglass pool include cantilever concrete coping, colored pool finishes, waterline ceramic tile, mosaic inlay tile, fiber-optic lighting, and water features. There are many choices to aesthetic of a fiberglass pool. This helps to make sure your needs are meet as far as looks go but at the same time does not look cheap. It has been a myth that if you live in wintry weather climate that fiberglass pools do not work due to the water freezing. Well that myth is false. Fiberglass pools are made for both warm and cold weather but if you do live in a cold climate you will have to winterize your pipes and that’s for any type of pool, whether it be a concrete, vinyl liner or fiberglass. Winterizing your pipes can prevent water from being stuck that could possibly freeze and crack. Fiberglass pools are not cheap to install. Vinyl liner pools are usually the cheapest to install when it comes to inground pools. But this does not mean that fiberglass pools are more expensive than vinyl liner pools. First let’s look at installation cost. Installation cost can vary depending on the size of the pool, the time of year you are installing the pool, if you are installing the pool yourself, and what you decide to add on to your pool. Let’s just say for comparison reasons that you are installing a turn-key pool package that includes professional installation for vinyl liner and fiberglass pools. Most turn-key packages for vinyl liner pools usually run about $45,000-$85,000, while turn-key fiberglass packages usually run around $35,000-$55,000. When you are comparing prices of a pool, there are things you need to look at. Such as Building and Installation, the electricity cost for running the pool, chemical cost, the Life span of the pool, and the amount of repairs the pool will need. When you look at the 10yr cost of owning a inground pool, all these things add up to $3750.00 for Fiberglass pools and $11,500 for vinyl liner pool. So, if you think about it a fiberglass pool maybe your best option in the long run. There is a little bit of truth to this myth. You may be limited to certain shapes and sizes when it comes to fiberglass pools. You can add bubblers or waterfalls to your pool to make it look unique. A wet deck is when a pool has a deck inside of it and is filled with 3-12in of water. This provides a space for the little kids to play, sunbathing, or if you just want to dip your toes in the pool. A tanning ledge is kind of like a wet deck. The ledge is much smaller, which only allows no more than 2 people to sunbath in only a few inches of water. Spas can be customized to match your complement fiberglass pool. Coping is the material used to cap the shell wall. Coping can be done in assorted colors and textures. Fiberglass pool shells are made in assorted colors including white, gray, and varies shades of blue. Tile can help bring out the colors and patterns to set the mood and space for your pool. Although you may be limited to the amount of shapes there are, you still have a lot of shapes available such as: Rectangle, Square, Circle, Oval, and Kidney Bean. The last option you have when it comes to fiberglass pools is size. You might have limited space for you and your family outdoors, but you can still pick the size of your pool that fits you and your family’s needs. There are a lot of myths out there about fiberglass pools. Some of the most common myths are that fiberglass pools either float or pops-up, they look cheap, they only work in warm weather, they are more expensive than vinyl liner, and they can not be customized. Honestly a lot of people shy away from fiberglass pools because they believe theses myths. Fiberglass pools are a great option for a lot of people. If you are looking to buy a fiberglass pool it is important that you do your own research about these pools. You will find out that a lot of these myths are not true and how they benefit you and your family. How do I choose the perfect sunroom for my home? Choosing the perfect sunroom requires many factors and a few new terms to consider. This information will help you research your options before making a purchase decision. When considering a new sunroom, be sure to ask about options for spacing between each window. Less spacing will produce a well-lit room that your family will truly love. Probuilt Patio Enclosures launches new blog for homeowners! A well-educated homeowner is a happy customer. We strive to provide all of the information needed to make the best decision on improving your home. Subscribe to find new ways to make your home the best place to entertain family and friends!